SPN Agenda is a breakout article from the main article on the State Policy Network (SPN). 1.9 9) "Special-Interest, Big Business Lobbying Groups?" SPN's innocuous-sounding purpose, according to its by-laws, is to "assist in organizing, developing and raising funds for institutes throughout the United States whose purpose is the promotion of authoritative ideas and research studies on state and local public policy issues in the public interest." When SPN founder Thomas A. Roe was asked in an interview about his role in encouraging the formation of state think tanks across the country, he recalled a mid-1980's conversation he had with fellow wealthy conservative donor and Heritage Foundation trustee Robert Krieble, in which he allegedly said, "You capture the Soviet Union -- I'm going to capture the states." SPN's founding executive director, Lamm, is quoted in the Arkansas Democrat-Gazette as calling what think tanks in the network do "constructive troublemaking." Lamm also told the Arkansas Democrat-Gazette that he discourages think tanks from classifying themselves as "state-based Heritage Foundation[s]," even though that's what SPN was founded to create (according to the National Review), because "[t]he labels are misleading, and they cause more harm than good." Like a fast food restaurant, SPN has worked hard to grow and franchise state-based think tanks, expanding that number from 12 in 1992 to 63 in 2013, with some states having multiple groups. And they continued to develop new and existing think tanks in 2011, receiving several directed, start-up grants from funders for groups in Florida and Arkansas. SPN facilitates networking and information sharing. One requirement of SPN member think tanks, according to the National Review, is that they share their publications with each other. "We trade information all the time and borrow ideas from each other," according to the Alabama Policy Institute’s Gary Palmer. Sometimes this sharing looks like cookie cutter academics frosted with different think tanks' logos. According to the New York Times, Lawrence Reed of the Mackinac Center for Public Policy "has a standard speech he calls the 'Seven Principles of Sound Public Policy.' [Christopher J.] Derry [of the Bluegrass Institute for Public Policy Solutions] added the words 'for Kentucky' and took it on the fund-raising trail. The Evergreen Freedom Foundation, in Olympia, Wash., is known for its guide to paring state budgets. Mr. Derry distributed it under the Bluegrass name. A Maryland paper on excessive lawsuits, republished in North Carolina, gained a third life as 'Preparing for Tort Reform in Kentucky.'" The Arkansas Democrat-Gazette notes that the Arkansas Policy Foundation expected in 1995, just after its founding, "to release a report containing charts, graphics and statistics describing life in Arkansas. The state's Index of Leading Cultural Indicators will mirror a national report with the same name released in 1993 by former U.S. Education Secretary William Bennett and the Heritage Foundation." SPN groups also coordinate national pushes in particular policy areas. Starting in 2007, the Texas Public Policy Foundation (TPPF) launched a national effort to reform criminal justice policy in the states. Within four years, at least nine other state think tanks were involved, echoing research and talking points, including in Delaware, South Carolina, Colorado, Georgia, Pennsylvania, North Carolina, New Mexico, Ohio, and Nebraska. Darcy Olsen, president and CEO of SPN member think tank the Goldwater Institute, told the National Review, "We're in the business of applied policy." Applied policy appears to translate to changing the law. Although they do not usually register as lobbyists, many SPN members advance legislation through ALEC and outside of ALEC. They are in constant communication with the legislature and have exerted strong influence on state laws. SPN appears to be a source of funding for the SPN member groups, but how funding SPN controls or directs is unknown. SPN gives some of its member think tanks anywhere between $9,000 and $122,000 a year, according to the organization’s 2011 IRS filing. But in 2012, a list of 2010 funders of the SPN member the Texas Public Policy Foundation (TPPF) became public and revealed some inconsistencies between what SPN tells the IRS it gives a think tank like TPPF and what TPPF reports. According to SPN’s 2010 IRS Form 990, it gave TPPF $19,500 in fiscal year 2010 (which is reported to be the calendar year). But according to Schedule B of TPPF’s 2010 IRS Form 990 (which was inadvertently made public), SPN gave TPPF $49,306.90, and SPN’s executive director Tracie Sharp was the contact person for an additional combined total of $495,000 from two unknown funds in fiscal year 2010 (which is also reported to be the calendar year for TPPF’s filings). Please see SPN Funding for more details, and more funders revealed by this document. The National Review notes that the individual SPN member think tanks "develop many of the ideas that rightward candidates can run on." But this effort goes far beyond generic talking points. In Wisconsin, for instance, the MacIver Institute ran a joint project fueled and funded by the Koch brothers’ Americans for Prosperity group in support of Scott Walker’s recall election. In a $3 million "It's Working!" TV ad campaign with an accompanying website and townhall events, the two organizations touted the successes of Walker's policies, including policies impacting workers, local governments, public education, and social programs. The website echoed many of the claims on Walker's taxpayer-funded "Reforms and Results" website, which had resulted in a complaint to the state ethics board. In many states, there is a revolving door between SPN groups and the Republican establishment. For instance, the staff at the Massachusetts-based Pioneer Institute for Public Policy has extensive ties to Mitt Romney's presidential campaign, as documented here. Through ALEC, SPN think tanks plan and conduct hundreds of “educational” workshops for legislators that often result in legislative push for a specific agenda. For example, Colorado’s Independence Institute gave a report on “public pension reform” at ALEC’s 2011 annual meeting, followed by efforts to privatize and otherwise alter pensions being introduced in 29 states in that year. Participants in SPN's predecessor organization, known as the Madison Group for its meetings at the ultra-luxurious Madison Hotel in Washington, D.C. (see SPN Founders, History, and Staff for more), "were active in assisting new state-based think tanks with public relations plans designed to garner press clippings from right-wing publications, along with state, local, and national newspapers and magazines. Despite corporate and conservative foundation support and a conservative agenda, these state-based think tanks were trained by the Madison Group to speak to the media and politicians in populist terms like 'Welfare Reform,' 'Empowerment of the Poor,' 'School Choice,' and now of course 'Paycheck Protection,'" according to a report. Today, SPN think tanks are hiring their own "investigative reporters" or hooking up with right-wing media outlets to push out their message. SPN’s 2007 annual meeting in Portland, Maine, included a session called "Strategies to Bring the Policy Heat: Collaborating with c-4s, Hiring Investigative Reporters and Using Litigation." Two years later, the Franklin Center for Government and Public Integrity -- a national non-profit organization that was created to fill a void in state capitol reporting caused by the loss of a third of the nation’s journalism jobs since 1992 -- was founded. The Franklin Center funds state news websites and wire services in more than 40 states. Despite their non-partisan description, many of these “news” websites have received criticism for their conservative bias. A majority (37) of SPN think tanks host Franklin "reporters" or publish a Franklin-affiliated publication, according to a review by CMD. As an example of how these outfits operate, New Hampshire's Josiah Bartlett Center for Public Policy (JBCPP) runs the Franklin site NewHampshire.Watchdog.org. The think tank's staffer Grant Bosse edits the publication. Not only does he use the platform to spin disinformation -- such as publishing "news articles" on how the Regional Greenhouse Gas Initiative (RGGI) is "all about money" while the publication and JBCPP strive to repeal it -- but he testifies to the state legislature against policies like RGGI without disclosing his ties to the JBCPP or the Franklin Center, as shown by the video footage obtained by the organization Granite State Progress (at left). Goldman was the first of the SPN member think tanks to open a litigation center as a permanent part of its organization. But as of 2012, Washington State's Freedom Foundation and the Nevada Policy Research Institute also have litigation programs, as do some of its associate members, like the North Carolina Institute for Constitutional Law. Delaware’s Caesar Rodney Institute launched a special fundraising campaign at the beginning of 2012 to pay for a lawsuit against the state of Delaware to challenge its practice of awarding state construction jobs only to contractors paying union scale wages, charging that the methodology used to figure out the prevailing wage rates was flawed. When legislation drafted by the think tank to address the perceived issue failed at the committee level, the group told SPN that it would take to the courts. Many of the SPN groups also submit amicus curiae briefs. Several, for example, filed briefs challenging the Patient Protection and Affordable Care Act in the Supreme Court case National Federation of Independent Business v. Sebelius. This program trains hundreds of conservative activists each year and connects them to other parts of the right-wing infrastructure for changing American law and society that the Kochs have helped build. Together with its ties to ALEC, the Heritage Foundation, and major right-wing funders like the Bradley Foundation, SPN's alliances and "troublemaking" activities enable it to be a major force for privatization and pro-corporate ideology in all 50 states. 9) "Special-Interest, Big Business Lobbying Groups?" SPN News publishes six times a year. ↑ National Committee for Responsive Philanthropy, Special Report: Burgeoning Conservative Think Tanks, organizational report, Spring 1991, p. 1. ↑ National Committee for Responsive Philanthropy, Special Report: Burgeoning Conservative Think Tanks, organizational report, Spring 1991, pp. 1 & 6. ↑ National Committee for Responsive Philanthropy, Special Report: Burgeoning Conservative Think Tanks, organizational report, Spring 1991, pp. 7, 11 & 17. ↑ State Policy Network, By-Laws of State Policy Network, official organizational filing, obtained from the New York State Office of the Attorney General on October 1, 2012. ↑ 9.0 9.1 9.2 Shareese Harold, "State Home to Think Tank with Conservative Bent" (sub. req'd. ), Arkansas Democrat-Gazette, July 24, 1995. ↑ 10.0 10.1 State Policy Network, IRS Form 990, organizational tax filing, March 29, 2012. ↑ 11.0 11.1 11.2 11.3 11.4 John J. Miller, Fifty Flowers Bloom: Conservative think tanks — mini--Heritage Foundations — at the state level, National Review, November 19, 2007. ↑ Jason Deparle, Right-of-Center Guru Goes Wide with the Gospel of Small Government, New York Times, November 17, 2006. 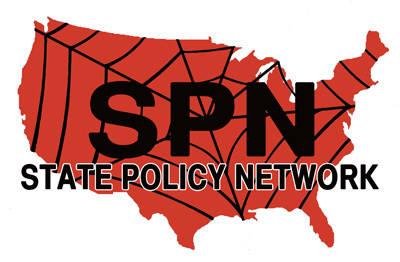 ↑ State Policy Network, The Interstate Freedom Network: Crossing State Lines to Drive Success, SPN News, February 11, 2013. ↑ Goldwater Institute, Health Care Freedom Crime Prevention Act, Interstate Health Care Freedom Compact, Health Care Freedom Act, and Revised Interstate Firearms Freedom Compact, organizational "model" legislation, accessed April 2013. ↑ 15.0 15.1 Forrest Wilder, Revealed: The Corporations and Billionaires that Fund the Texas Public Policy Foundation, TPPF Donor List, Texas Observer, August 24, 2012. ↑ Mary Bottari, Pro-Walker Ads, Courtesy of Koch Industries, PRWatch.org, November 30, 2011. ↑ Center for Media and Democracy, Pioneer Institute for Public Policy, SourceWatch.org wiki, accessed April 2013. ↑ National Conference of State Legislators, PENSIONS AND RETIREMENT PLAN ENACTMENTS IN 2011 STATE LEGISLATURES, organizational publication, January 31, 2012. ↑ 21.0 21.1 21.2 21.3 State Policy Network, SPN News January/February 2012 Newsletter Updates, organizational newsletter, January/February 2012. ↑ State Policy Network, SPN News January/February 2013 Updates, organizational newsletter, January/February 2013. ↑ State Policy Network, Institute Updates January/February 2009, organizational newsletter, January/February 2009. ↑ National Education Association, The Real Story Behind 'Paycheck Protection': The Hidden Link Between Anti-Worker and Anti-Public Education Initiatives: An Anatomy of the Far Right, Chapter 4: "The State-Based Assault: The State Policy Network," organizational report, 1998. ↑ Rebekah Metzler, Website faulted for half-reporting Pingree story: Reports fail to allow other side to be given, Kennebec Journal, October 2, 2010. ↑ Sara Jerving, How a Right-Wing Group Is Infiltrating State News Coverage, PRWatch.org, July 12, 2012. ↑ Grant Bosse, Josiah Bartlett Center for Public Policy, Changes in Greenhouse Gas program are all about money, New Hampshire Watchdog organizational publication, February 19, 2013. ↑ Granite State Progress, Grant Bosse Testimony on HB 630-FN, organizational video publication, March 21, 2013. ↑ Freedom Foundation, About, organizational website, accessed September 2012. ↑ Phillip O'Connor, St. Louis Couple Fight Government with Advocacy Center, St. Louis Post Dispatch, August 2, 2011. ↑ North Carolina Institute for Constitutional Law, About, organizational website, accessed September 2012. ↑ Institute for Humane Studies, State Policy Internships, organizational website, accessed September 2012. ↑ Tony Ortega, Think Tank Warfare, Phoenix New Times, May 13, 1999. ↑ Center for Media and Democracy and Arizona Working Families, A Reporter’s Guide to the Goldwater Institute: What Citizens, Policymakers, and Reporters Should Know, organizational report, March 14, 2013. ↑ State Policy Network, Publications: Browse by SPN News, organizational site, accessed August 18, 2011.